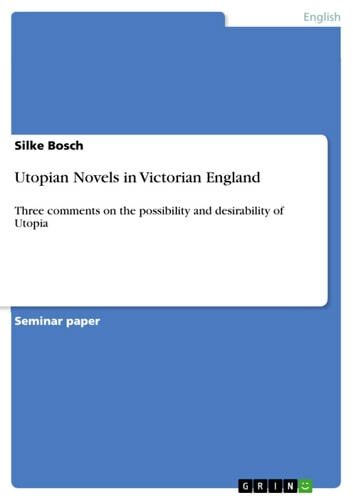 Seminar paper from the year 2004 in the subject English Language and Literature Studies - Literature, grade: 1,7, University of Potsdam (Anglistik/Amerikanistik), course: Victorian Novels, language: English, abstract: The aim of this paper is to compare three of the most influential Utopian novels of the Victorian era in Great Britain: William Morris´ News from Nowhere, Samuel Butler´s Erewhon and Edward Bulwer-Lytton´s The Coming Race. ... I will concentrate on a specific aspect which struck me as most interesting. The question I want to pose is in how far the works are still hopeful and positive and how far they are already disillusioned and negative. 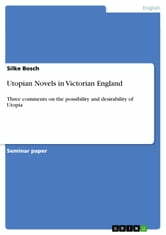 Do they consider the idea of a utopian and perfect society to be desirable and possible? I found that Morris' News from Nowhere is still a classic Utopia as it depicts a hopeful prospect of an ideal state of society, but it also introduces a new notion. A utopian society is not something out of human reach, but can be realised entirely. Morris' basis was Marx' theory and he really believed in the possibility of a truly communist and happy nation. Butler's work Erewhon should be rather called a satire, as it is mostly a criticism of Victorian society. But still, it uses the frame of a Utopian fiction and therefor also comments on it. From Erewhon can be concluded that mankind is not capable of true improvement and that a perfect system is intolerant and oppressive. Lytton's work The Coming Race is a mixture of criticism, offering answers and for the most part a discussion of the perfectibility of men and the desirability of perfection, coming to the conclusion that perfection and the desire for it is rather a threat to mankind. Sound or silence, loss or gain? To what extent do the Brothers Grimm conform to contemporary eighteenth century notions of gender in their tales? Identity Greatest Quotes - Quick, Short, Medium Or Long Quotes. Find The Perfect Identity Quotations For All Occasions - Spicing Up Letters, Speeches, And Everyday Conversations.